The distinguishing feature for many workers in South Korea is contractual – and often involuntary – retirement at a young age (mid-50s for most workers) followed by precarious and low-paying self-employment or contract work. In the past this practice, which is also found in other East Asian nations, provided firms with a youthful and highly productive workforce. However, with a rapidly aging population and shifts in the labour market, the existing arrangement is becoming less and less functional. This book examines how this retirement arrangement arose, and the policy reforms that have been both undertaken and proposed to allow workers to remain employed longer. The analysis focuses on the institutional constraints to reforms, as well as the impact forced retirement has on individuals. 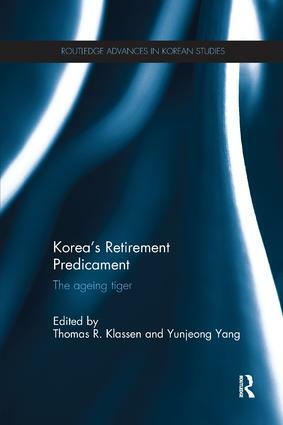 Using a multi-disciplinary and comparative approach, the authors study contractual mandatory retirement trends and policies in South Korea, and in doing so illuminate the political, social, legal, economic and labour market implications of this widespread practice. As nations across Asia face aging populations, this book will be welcomed by students and scholars interested in Korean studies, social policy, social welfare and gerontology. It will also be of great value to policy makers.